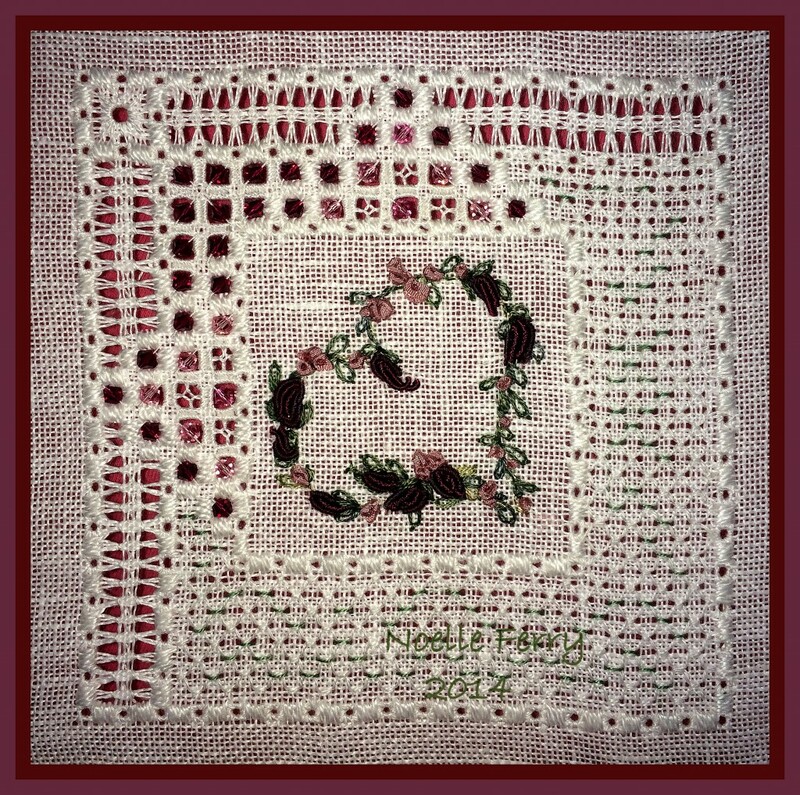 This is a Victoria Sampler design that I worked within one of the cyberclasses that I took at VS (Sept 2014). 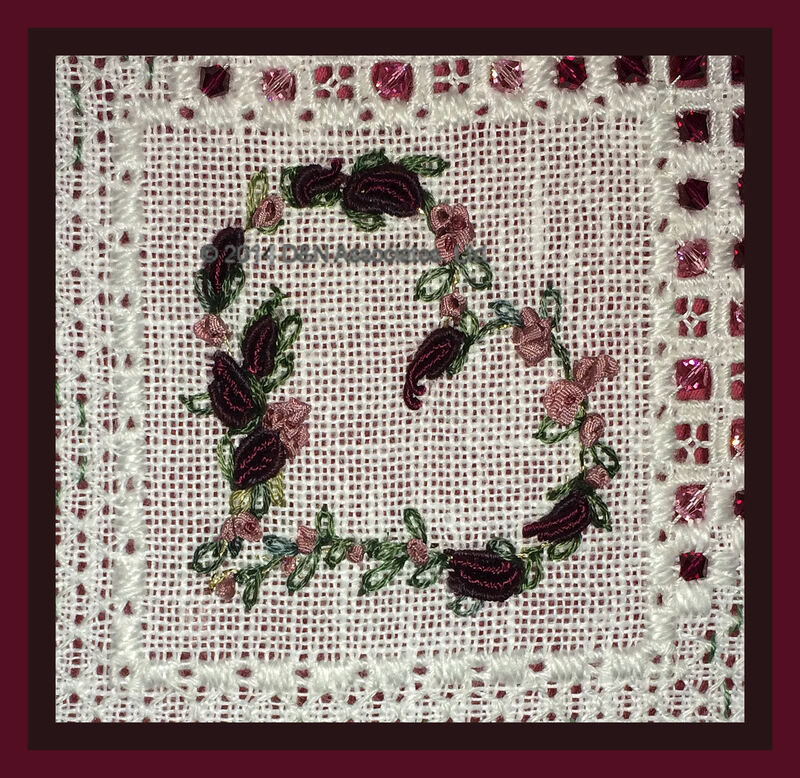 There are two styles to this design offered within the pamphlet, this is the box topper design that is 70w x 70h (4.4″ Wide x 4.4″ High, if worked on 32 count Antique White Belfast Linen). I worked this on a 28 count fabric. 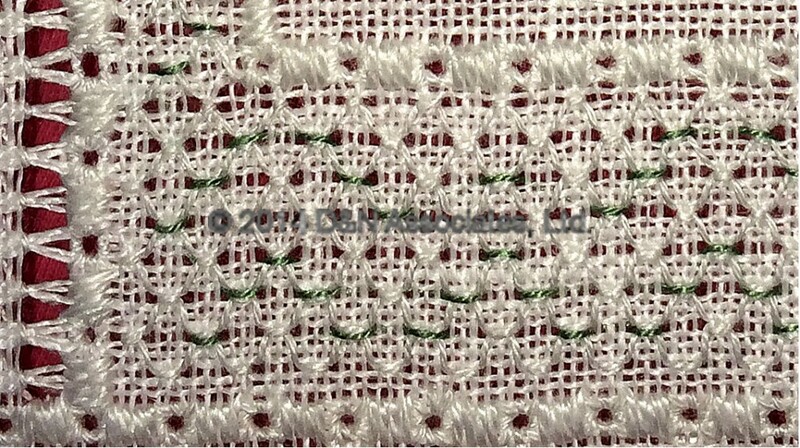 It is a very easy fabric for pull work, but I do not care for the openness of the weave. Wanting the worked design to be about five inches square I reduced the Kloster blocks by one stitch so that the ‘to be’ cut area of each set of Kloster blocks was three by three snipped threads. I did do the regular over four threads for the Kloster blocks so that I could do weaved bars. 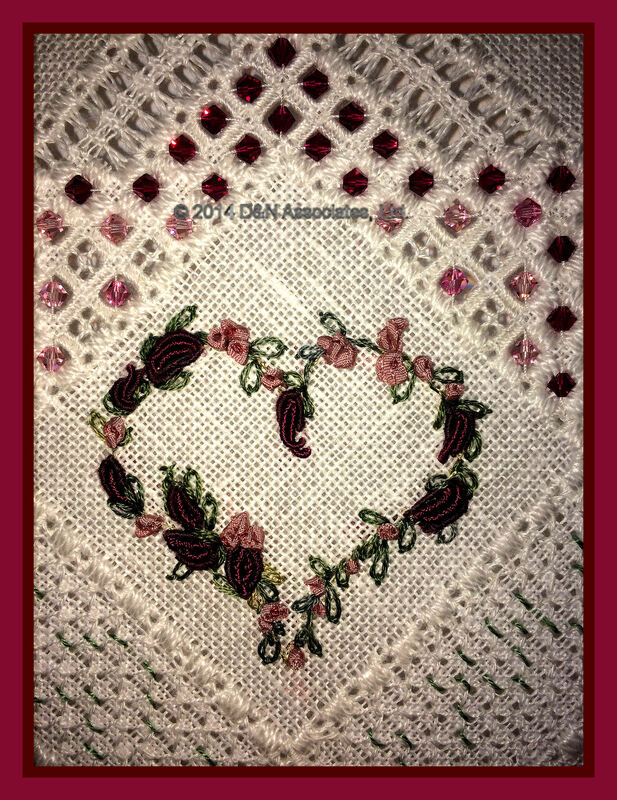 I want to make the comment that it was very frustrating taking photos of this piece as the floral center heart bullion flowers are stitched in lovely rich ruby and mullberry tones. It don’t show much color in these photos but if you click the photos and view them enlarged you can see the colors. Same for the Swarovski crystals. 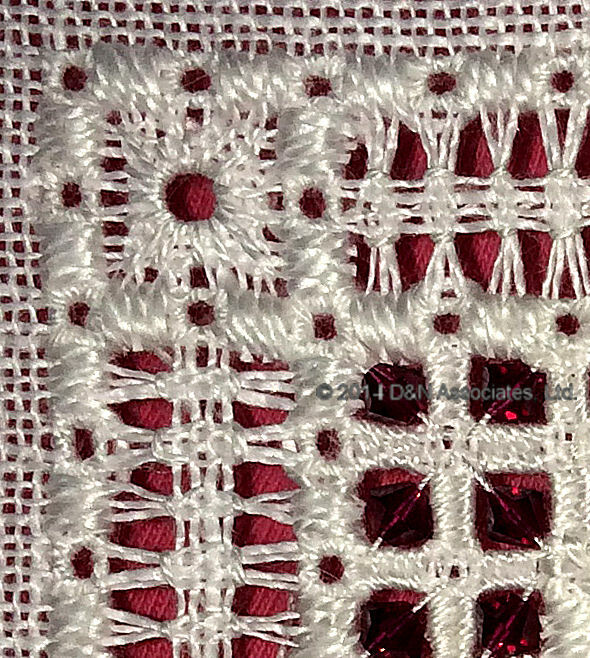 I learned a stiched called honeycomb within this design, quite liked it (closeup of this stitch can be view by clicking the last photo at the bottom of this post) such that instead of stitching four areas of Kloster blocks with dove eyes I reduced that to two areas and expanded the honeycomb stitch. 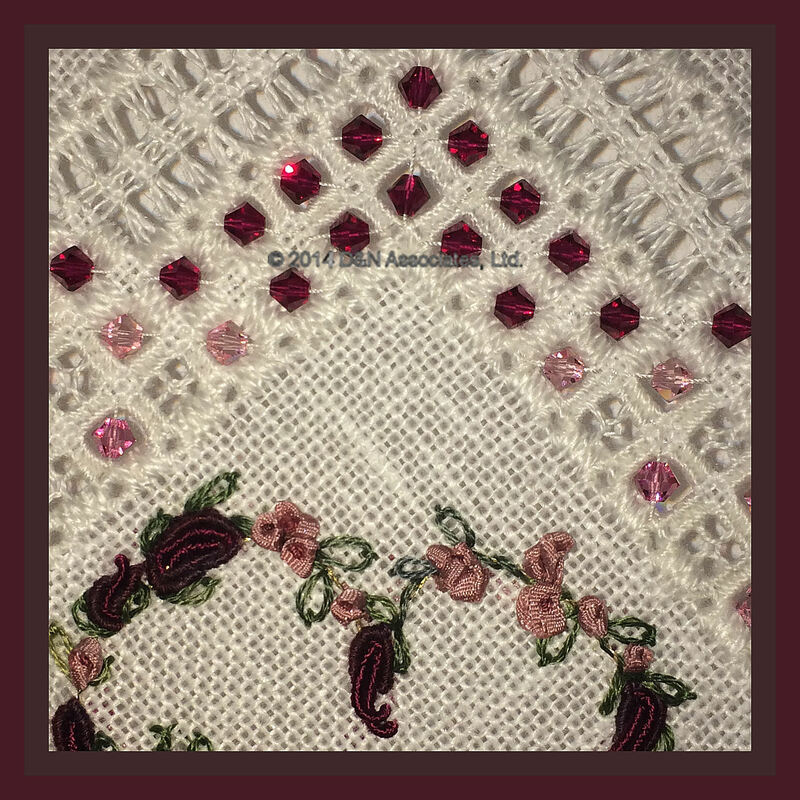 The Kloster block smaller size open areas (of the removed three by three threads) gave me a nice place to add 3mm bicone Swarovski crystal beads. 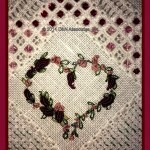 The Swarovski colors that I used were Ruby, Rose and Light Rose. Below photo shows finished piece adhered to lid of a 7-inch paper mache 7 x 3 inch deep round shaped box. I purchased this unfinished paper mache box at a local Michael’s craft store then spray painted the box using a dark blue gloss paint. The finished stitched piece was adhered to a quarter inch thick mat board with dress maker pins along the raw edge of the mat board. I used the Kreinik Custom Corder and size 5 Perle thread to create the narrow med slate blue braid. 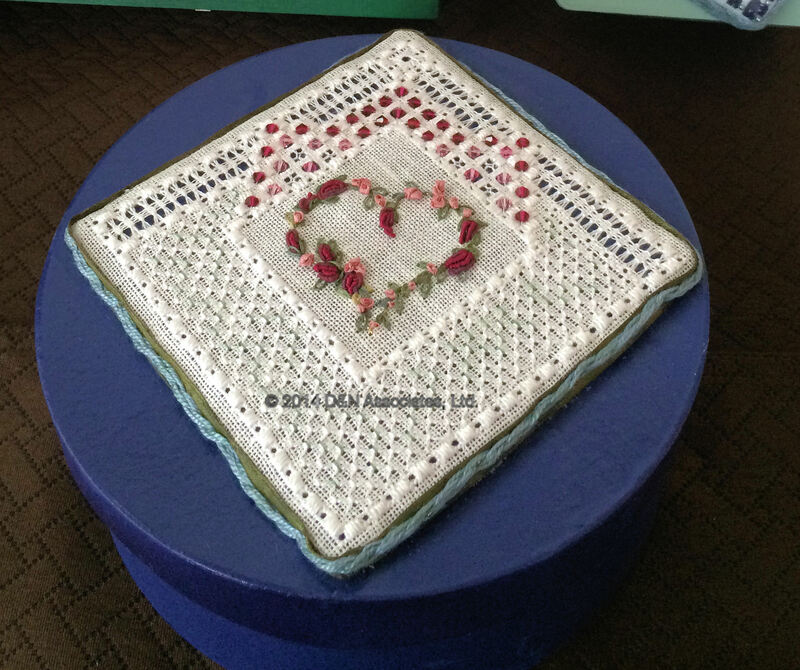 I first glued an olive green satin ribbon around the raw edge of the mat board then I pinned on the narrow blue braid around the edge of the mat board after which I glued the mat board onto the top of the box lid.